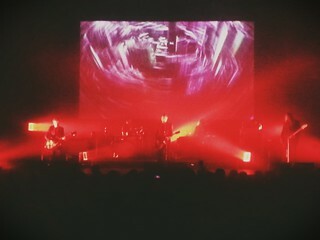 4 years later and Interpol was finally back in town and Im so glad that I ended up with a friend’s ticket. The band had finally released a new album, El Pintor. The album is brilliant and is a nice reminder of where they came from having a very similar sound to Turn On The Bright Lights. 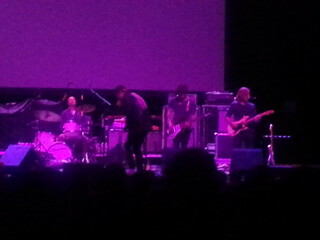 Sure, theres no Carlos D(engler) and the sound had to change some but its distinctly Interpol. While I usually seem to loathe the sound at The Fox, for whatever reason it worked with Interpol and they sounded great. The guitars sounded a bit muddled at times, but it worked and added texture to their songs. Paul’s vocals were haunting over the lush guitars swirling in the background as the band started playing ‘My Blue Supreme’. It was a great way to start the set and then without disappointing they went straight to their first album to play the catchy-fast paced ‘Say Hello To the Angels’. The crowd quickly got into it with lots of hand clapping and fist pumping. And then straight into the even more catchy ‘Evil’ which had everyone singing along and dancing. Their music is just perfect and so easy to get lost in with the guitars and the drums thumping along keeping the timing. Interpol also had their live debut of one of my favorite new tracks ‘Everything is Wrong’. Paul Banks: “That was ‘Everything Is Wrong’… that was the *debut* of ‘Everything Is Wrong’…as a matter of fact.” Enveloped in red lights and different imagery on the screen, the band played the hell out of the song. The band never sounded more gorgeous than during ‘NYC’ with the images of the skyline swirling in fast motion behind them. Paul’s vocals were hauntingly beautiful with the pulse of the guitars filling the air. Plus, Narc, Not Even Jail and Slow Hands right before they went into an encore. Yowzers! It does NOT get better than that. The band did an awesome mix of songs and really catered to older fans of the band focusing on the brilliant album ‘Antics’. The breakdown consisted of 6 songs off of El Pintor (the painter in Spanish) but also an anagram of Interpol; 5 songs from ‘Antics’ and 3 songs from ‘Turn on the Bright Lights’. Then one each from the other album. Of course, theres always bound to be a disappointment and it would have been great just to hear ‘How are things on the west coast?’ (the opening line to Heinrich Maneuver). Ah well. I seriously could not complain about the set. It was short as I had expected it to be, they were never a band that played for a very long time. But they packed the set with a punch. Interpol has had a few changed with members over the years, but has added to the mix Brandon Curtis (mostly known for Secret Machines) on keyboards and vocals as well a new touring bassist, Brad Truax. The additions were great. And yes, its hard not to miss Carlos D. (he was insanely great on bass), Brad held up his own. He sounded excellent with his hair flying all over the place as he tore through the songs. Brandon Curtis is also a great addition and sounded like he’d been playing with the band all along (granted Secret Machines toured with them a bit, so it was already a great fit). Daniel as always worked the stage going back and forth and doing quite a bit of dancing. Clearly always enjoying himself. And Sam Fogarino sounded great on drums, always keeping the band connected. If youre on the fence about seeing them and enjoy their new album, its quite worth it. With such a great mix of songs, its hard to leave disappointed. Rey Pila, from Mexico City, opened the set. The poor lead singer forgot where he was off the bat and said something to the effect of being so glad to be in Sacramento! Doh! These things do happen, and he tried to play it off and ask about the Raiders. The crowd was not having it. I was a huge fan of them at SXSW and their music still sounds great. Clearly a throw-back to the new wave 80s, they had totally reminded me of a new version of The Cars. One with much more guitars but still plenty of keyboards. Not quite as funky as I had remembered them, I still enjoyed their set immensely. The lead singer was dancing up a storm and worked the stage. He even hopped down below more than a few times to be closer to the fans. Clearly enjoying himself, and getting over his faux-pas. 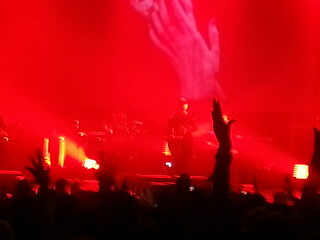 Definitely not one of the more typical Interpol openers, but really great. Double Rainbows and Beirut Oh My! What could have turned into a miserable evening, with a huge rainstorm that dampened us all, turned out to be one of the most lovely evenings in Brooklyn. To get it out of the way – yes there was a double rainbow. My friends had been looking for rainbows after the storm had passed and soon enough theyre screaming ‘OH MY GOD. Its.A.Double.Rainbow. Film.It!’ No, there was no way in hell we were recreating that video. But, yes, there was indeed a double rainbow and lots of rain! Beirut (Zach Condon and Co.) played an amazing set. Not playing with a full orchestra (oh how I miss your church shows), he did have 4-5 other guys playing with him doing double duty on the instruments. Playing in the outside, facing the Empire State Building and the Chrysler Building, their sounds filled the nighttime air. People living nearby came out to listen to the show from their roofdecks. Their new songs sound so beautiful, that I had forgotten how much I had loved their music. People were in good spirits, but I was surprised that more people werent dancing at all. A lot of people just stood with their arms crossed looking bored out of their minds. The setlist contained many of their staples with “Postcards From Italy,” “Sunday Smile”, “Elephant Gun,” “Nantes,” “Scenic World,” and “Mount Wroclai”. Their indie/gypsy/balkan/romanian sound makes for a good change from the many same-sounding bands in Brooklyn. The horns are always such a great addition for most bands. They played for about an hour and 15 minutes and had an encore with just Zach Condon playing “The Escape” which he noted he hadnt played in a very long time. It was a beautiful way to end the night. 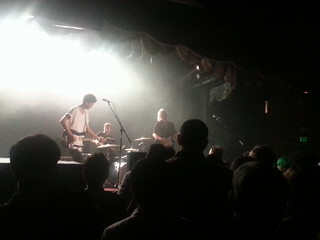 Sharon Van Etten was an incredible opener. I had only known her by name, but a friend had told me her voice is amazing. That cant even possibly describe her strong vocal performance. She hurried her way through a set which seemed like it was over way too soon. She thanked her Dad (it was Fathers Day that Sunday) for coming all the way out from New Jersey. And along the way thanked her other family members for coming out to support her. Towards the end of her set she brought out Ben Lanz and Aaron Dessner of The National. He is producing her latest album and he added some guitar to her songs. Yellow Ostrich started out the show and I must have had them confused with another similar sounding band name. I was pretty sure it was just one person, but turns out it was a full band. They were really good and had some really catchy songs. They seemed excited to be playing towards a bigger audience. It was a great combination of bands. All of them were really good and it was definitely a show where you would not want to have missed any of them. 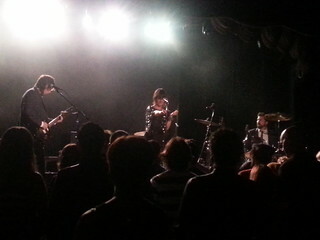 I will definitely be checking out Sharon Van Etten again soon. Ive seen her name all over the place, but after hearing that, she is fully worthy of the hype.